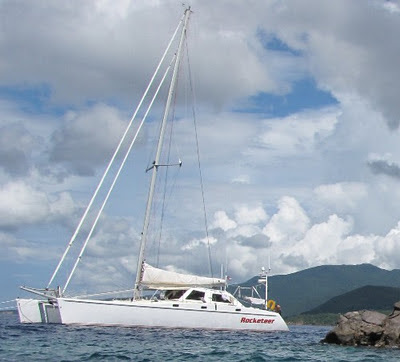 Luxury Catamaran Rocketeer is offering: Special - two complimentary 20 minute massages and then onboard massage available at $50 per massage. Also, free yoga instructions and morning stretch. We invite you to experience our fun and healthy lifestyle aboard Rocketeer. Our premise is simple, we welcome you as friends visiting our home. We pay close attention to your needs and help guide you through an unforgettable vacation. We will tailor your experience to suit your interests and desires. You set the expectations and we aim to exceed them. We use our experience, local knowledge and skills to make it the best vacation for you. Join us for an unforgettable time aboard Rocketeer! Rocketeer is an Atlantic 55 performance catamaran best described as plush but fast. She will out-sail most charter boats in the Caribbean yet she is extremely seaworthy and comfortable. Her speed allows for an extended cruising range not possible in slower vessels. A spacious pilot house plus her stability and power make it possible to sail comfortably for long distances if desired. Her unique layout makes time at anchor especially enjoyable. For the deepest relaxation possible on your adventure vacation, take advantage of our special expertise in spa treatments. Spa services available onboard for women include massage, facial, pedicure, manicure, and Brazillian wax.